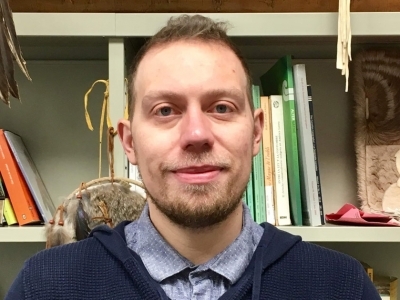 Ian Wereley went the distance with his post-secondary schooling, and he did it all in the Department of History at Carleton University. In 2018, he completed his Ph.D. having taken the less than traditional route of completing all three of his degrees in the same department at the same University. He adored his home department, so the notion of leaving Carleton never felt like an appropriate option. Rather, he spent 12 very productive years studying, writing, researching, and collaborating with his peers and mentors in History. During this time, Wereley focused his academic study on the history of energy. His Master’s thesis examined the global social consequences and implications of Britain’s transition from coal to oil during the early twentieth century. For his Ph.D., he continued within this area of scholarship by analyzing the socio-cultural impacts of petroleum. 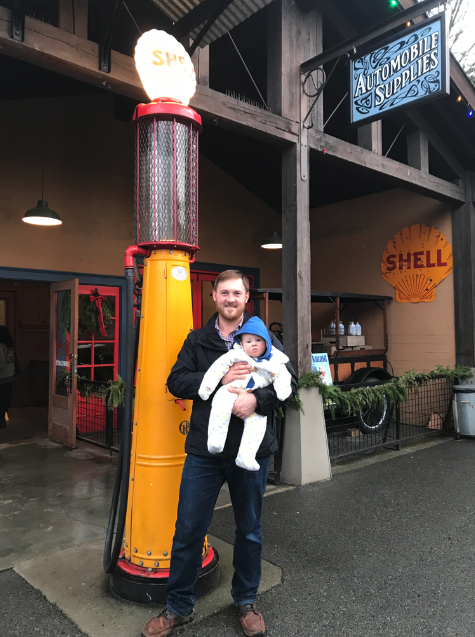 His dissertation Imagining the Age of Oil: Case Studies in British Petrocultures, 1865-1935 was nominated for a Senate Medal and a 2016 Graduate Research and Innovating Thinking Award. Wereley’s choice to run the history gamut at Carleton was not very conventional, but as is demonstrated by his newly forged professional career, “convention” doesn’t dictate any of his endeavours. 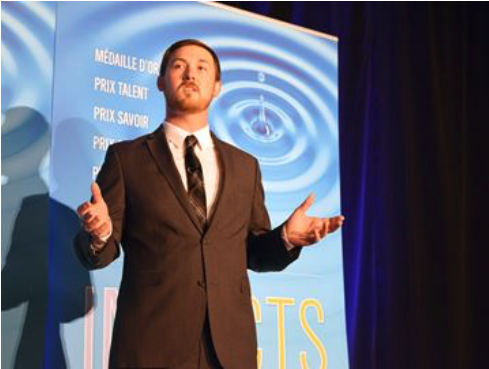 Currently, Wereley is using what he describes as the dynamic transferrable skills he picked up while pursuing his History degrees to synchronously work multiple unique professional positions, two of which he industriously created for himself. The now fully-accredited energy historian industriously began a tutoring company in 2012, and also leads historical tours of Ottawa. Wereley also works for the Canadian Association for Graduate Studies, as their public relations and communications director and occupies two impressive research positions — one at the Royal Society of Canada’s national archives, and another at Library and Archives Canada. To no surprise, Wereley wasn’t ready to part ways with Carleton’s History Department, and he is currently preparing to teach the course A History of Oil for the second time. Of all these remarkable feats, perhaps the most inspiring is Wereley, who also happens to be a new father, has managed to not work a minute outside of a typical 9:00 am to 5:00 pm workweek schedule. Recently, the Faculty of Arts and Social Sciences had a discussion with Wereley about his ongoing interest in the past, present, and future of oil (at a crucial national moment in this discussion), his continuing time at Carleton, and how a History degree has helped innovatively curate for himself an extraordinary professional life. Ian, you’ve spent twelve years at Carleton studying history, in that time, how have you grown as a person, an academic, and into a professional? Yes, twelve years at Carleton University — but who’s counting?! Well, maybe my friends, my family, and my family’s friends. To say that Carleton has been my home away from home is an understatement. I knew when I began my studies in the Fall of 2006 that I was embarking upon a journey that would define my future. Little did I realise the extent to which this would become true. In my undergraduate coursework, I dedicated myself to exploring Canadian and international history during the twentieth century. To my surprise, I discovered that oil, and energy in general, were largely invisible subjects — things that were simply ‘there’ in the fabric of history, but that were rarely considered or problematized on their own. After taking several inspiring history courses early in my undergraduate degree, I began to see a future as an energy historian. Outstanding Professors like Norman Hillmer and Aleksandra Bennett added jet fuel to my passion for history, while at the same time they taught me the art and craft of careful historical research. It goes without saying that Carleton University, the Department of History, and my teachers and mentors have all played an essential role in shaping the person that I am today. And then you immediately went on to pursue graduate work, correct? That’s right. In the fall of 2010, I began a Master’s degree at Carleton in which I continued to study British and Canadian history through the lens of energy. My thesis explored the transition from coal to oil fuel that occurred in the British Royal Navy during the early twentieth century, and the sociocultural ramifications that this shift created for Britons at local, national, and international levels. Here, too, the knowledge, guidance, and support of educators like Dominique Marshall, Tim Cook, Jennifer Evans, and David Dean were critical to my development as a student, but also as a young professional preparing to enter the workforce. I finished my MA with a hunger to learn more about the history of oil and its impact on everyday life, both in the past and in the present. In the Fall of 2012, I began my PHD at Carleton with the aim of exploring the social and cultural aspects of petroleum. In this program, I learned how to disentangle the messy and complicated events of the past, and to pick out important lessons for navigating my own changing energy landscape. In June 2018, I graduated from Carleton for the third and final time. There is a perception out there that a graduate student should never do all three of their degrees at one institution. The thinking being that there are too few opportunities to connect with scholars in the field, or that a student may become coddled by their home department. In some instances, I am sure, these concerns are warranted. But in all my years at Carleton I have found quite the opposite to be true. Year after year, I have discovered at Carleton an abundance of new ways to learn, connect, and grow, both as a student and as a young professional. I have fond memories of contributing to various student clubs and societies, and of participating in networking events like undergraduate colloquiums and graduate student conferences. Practically every semester there was a new competition, contest, or prize that I could enter to challenge my research and writing skills, and I was fortunate to have undertaken dozens of training sessions and mini-courses designed to enhance my teaching abilities. Finally, I have learned from some of the most inspiring thinkers in the fields of history, philosophy, law, and geography, and have recently been granted an opportunity to teach my own course to the next generation of Carleton students. Why, in your opinion, is understanding cultural history important? How does it help us to cultivate a better sense of the present and the future? The old adage that “until you know where you have been you don’t know where you are going” is certainly something that I have come to appreciate over the course of my studies at Carleton, particularly in more recent months. We all know of history’s ups and downs, the periods of plenty and of scarcity, the moments of peace and of war, and the rise and fall of different peoples and ways of life. Sometimes it seems like we are living in an age where all of these are happening all at once! But I believe that the past holds a treasure trove of ideas, insights, and lessons that can be used to navigate the rising number of daunting challenges that confront us in the present day. In my mind, history is a wheel that turns left and right, forwards and backwards, sometimes fast and sometimes slow, or sometimes not at all. I think this metaphor opens up opportunities to learn from both the triumphs and mistakes of the past, and to think of ourselves as being in charge of our shared direction or “route.” With a strong understanding of local, national, and global history, we can make informed decisions about what speed and direction we would like the wheel of history to go next. Well said. What drew you to the study of oil? Since I was a child, I have been fascinated by this mysterious resource. My family has a long history of working with oil, and it is largely because of them that I have chosen to study it. My grandfather worked for Esso Oil in Montreal and, later, so did my mother. During her teenage years, she took on a neat job in which she would drive around to Esso Gas stations as a secret customer, and report to her bosses on the fit and finish of the experience. In her yellow Dodge Dart, she visited every Esso station in the province of Quebec and collected enough colourful stories to last a lifetime! My paternal grandfather was a master mechanic in Cornwall, and he collected numerous antique cars and tractors. 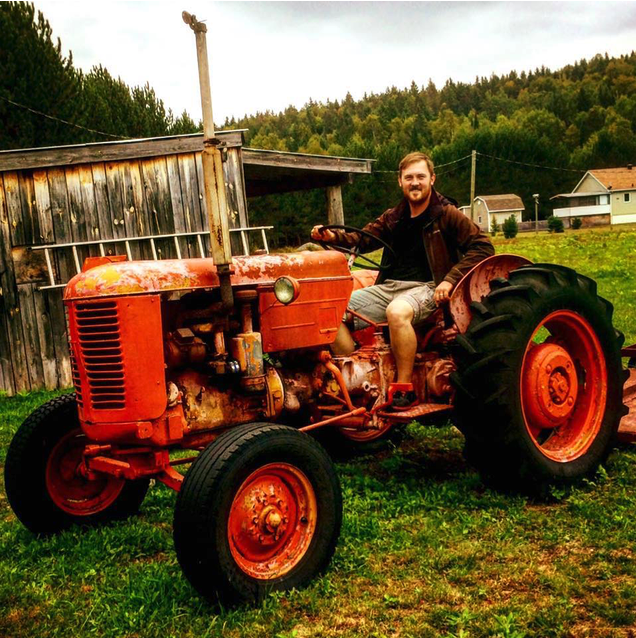 Indeed, one of my earliest childhood memories is seeing, hearing, and smelling him fire up an old 1947 Massey Ferguson tractor, and letting me steer it while I rode on his lap. That feeling of freedom, independence, and exhilaration never left me. But I believe that the past holds a treasure trove of ideas, insights, and lessons that can be used to navigate the rising number of daunting challenges that confront us in the present day. In my mind, history is a wheel that turns left and right, forwards and backwards, sometimes fast and sometimes slow, or sometimes not at all. Indeed! Oil also conditioned my upbringing in Brockville, Ontario. Some of my fondest memories involve watching the daily procession of freight trains and steamships laden with oil, which passed through my community on their journey from some unknown place to another. As I grew older, I began to drive my parents motor vehicle — a champagne coloured minivan that still makes me cringe to this day. But in that caravan, I felt I could go anywhere, do anything, and bring everyone with me! Seeing, smelling, and using oil in these ways led me to ask several fundamental questions: What is oil, where does it come from, and why is it so important? Indeed, these questions continue to fuel my interest in oil to this day, and they provide the foundation of my current scholarly work and research. My friends say that I’m obsessed with oil, but I prefer enthusiastic! Oil remains as mysterious and fascinating to me today as it was during my youth, and I consider myself lucky to be pursuing a career that connects the dots between my past, present, and future. 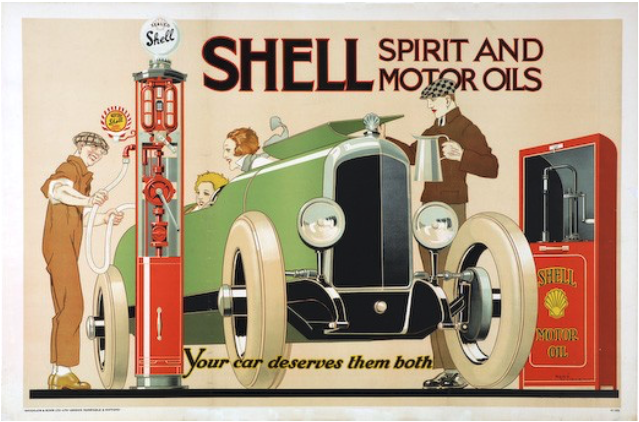 Shell Oil newspaper advertisement, Britain, 1928. I get why it’s so fascinating — I imagine that in a lot of ways, oil plays a vigorous role in our overarching understanding of Canadian identity. What have you learned about yourself, others, Canada, and the world at large through researching oil? Today, oil issues dominate local, national, and global conversations about energy. Turn on any news channel, pick up any current affairs magazine, or eavesdrop on the conversations of your local coffee shop — oil products and technologies, as well as their environmental impacts and economic benefits, are everywhere. The subject of oil is now more than ever a national concern of supreme importance, presenting daunting challenges for future policymakers and everyday consumers alike. Leduc #1 Derrick, Alberta, 1947. 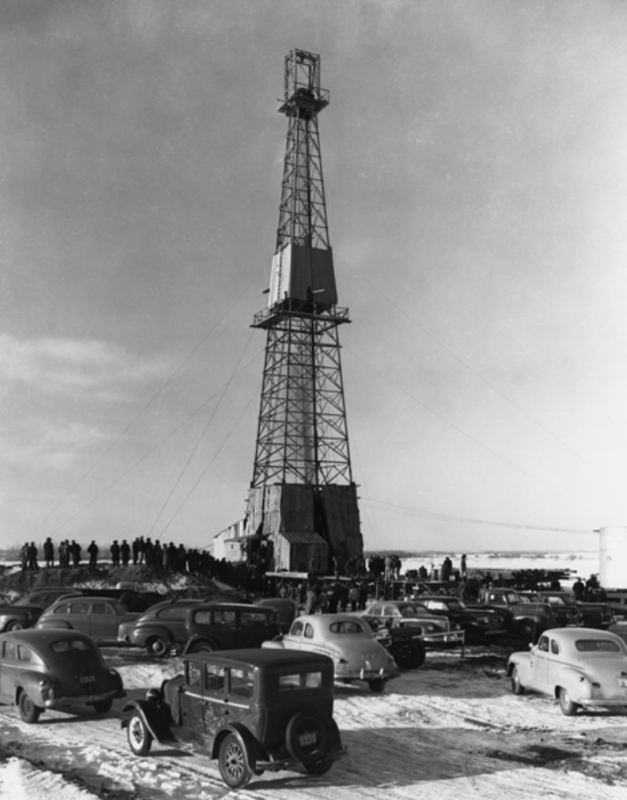 Western Canada first major oil boom. For Canadians, in particular, oil has become such an integral component of our political culture and identity that it is difficult to imagine ourselves living without it. The resource is practically omnipresent in our daily lives, and it constitutes a significant part of our economy. Yet, as I have discovered in my research, the history of oil is a relatively invisible subject for most Canadians. Many would be surprised to learn that the modern oil industry got its start in rural southwestern Ontario, and that some of the first and oldest oil companies in the world were headquartered in Canadian cities. Indeed, oil is as Canadian as maple syrup. But we also share a rich history in researching and developing innovative ways of managing the negative consequences of oil extraction. Like all histories, the Canadian experience with oil has been messy, complicated, and contentious. This is not a detriment but a benefit to Canadians. Here again, I believe the past offers some valuable lessons for understanding who we have been, who we are, and who we want to be in the future. Indeed, oil is as Canadian as maple syrup. But we also share a rich history in researching and developing innovative ways of managing the negative consequences of oil extraction. Like all histories, the Canadian experience with oil has been messy, complicated, and contentious. 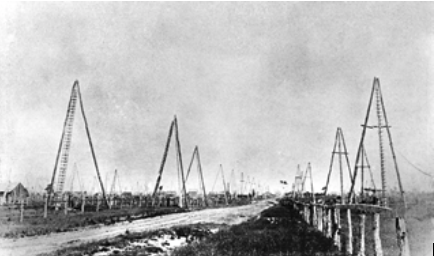 Some rudimentary oil derricks near Petrolia, Ontario, 1860s. This was the site of the world’s first oil boom, and a relatively unknown chapter in the history of oil. Speaking of historical lessons that can help prepare us for the future, as we take the first steps towards grand scale alternative energy sources, what can we learn from the British transition to oil from coal? How do you see this shift going for Canadians? Believe it or not, there are many striking similarities between the historical energy trajectories of Britain and Canada. A central task of my research over the past several years has been to reconstruct the shared energy experiences of Britons and Canadians over the twentieth and twenty-first centuries, and to glean insight for navigating our current and ever-changing energy landscapes. My thesis and dissertation both explored the British transition from coal to oil, which occurred during the late nineteenth and early twentieth centuries in a rapid and unpredictable manner. I chose Britain as a case study because it was the first industrialised society to adopt oil on a national scale. Additionally, Britain’s transition to oil fascinated me because it had occurred during a period when it was the largest coal producing country in the world. In other words, Britain shifted to a new and untested source of energy — oil — despite having massive quantities of an existing and well-established energy source — coal. 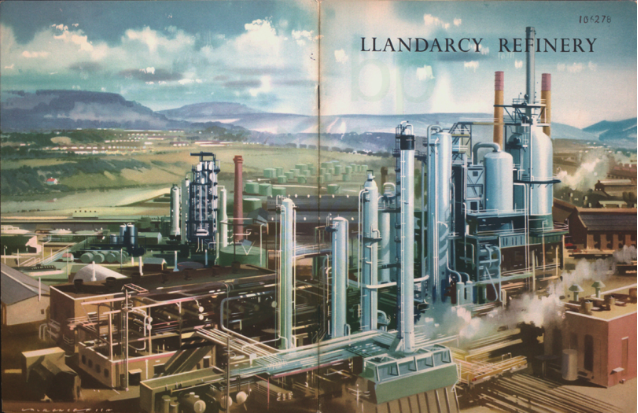 Artist’s rendering of the British Petroleum (BP) oil refinery in Llandarcy, Wales, 1922. It was the UK’s first oil refinery. In my mind, Britain’s predicament in the early twentieth century is precisely the one in which Canada finds itself today: we have an abundance of oil, yet we are already beginning to feel the stresses of a world moving away from fossil fuels. Will we cling on to oil and the oil industry? Or will we be the next pioneers in alternative energy technologies? The answers to these questions can only be found through an increase in energy education. As I mentioned before, we cannot know where to go if we have little understanding of where we have been. To these ends, I recently developed an online course on the History of Oil, which I had the privilege of teaching at Carleton during the Summer 2018 term. Is this an under-scrutinized area of inquiry? It seems so crucial that we cultivate comprehension of energy and its social and environmental impacts. To my knowledge, my course was the first online course in Canada to explore the history of oil, and it was a smashing success. In the course, students explored the history of oil from the ancient period to the mid-twentieth century, while also conducting conversations about the present day and the future. We examined a wide variety of topics, including the origins of oil, and the scientific and technological processes by which it is extracted and refined. We learned about the regions and countries that have played a major role in the history of oil, and located some points of conflict and cooperation between them. Finally, we analysed the images, stories, and ideas that have been used to think about oil in the past, and tried to find similarities and connections to how we interpret oil today. Specifically, students followed a series of themes as they moved through the course — science, technology, culture, and conflict — which guided their learning of the key people, places, and processes that have shaped the history of oil. These themes were also used to design the assignments and activities the students completed in the course. The goal of the course was to give students a better understanding of oil and the ways in which this fascinating resource has shaped our everyday lives. My ultimate goal in making this course was to equip learners from all disciplines with the knowledge necessary to make informed decisions about oil. It is my hope, therefore, that this course on the transition toward oil will help present and future students of energy to imagine the next major energy transition away from oil. I quickly discovered that I made the most amount of money whenever I leveraged the maximum number of my skills. As a humanities student I was constantly reminded of the “transferable skills” that I was acquiring in my degree, and as a history student, in particular, these skills are what I relied upon every time someone asked me if my job was to memorize people, places, and dates. In addition to teaching at Carleton, you’ve managed to forge quite a career for yourself. If my information is correct, you are currently conducting research at Library and Archives Canada and the Royal Society of Canada while simultaneously doing Communications at the Canadian Association of Graduate Studies. On top of all that, you also started your own tutoring company in 2012 which you continue to run and also work part-time in the summer and fall as a tour guide for See Our City Ottawa. Could you tell us about these roles? My funding expired toward the end of my Ph.D., and I began to search for part time work that paid well and didn’t require a lot of time. You can imagine this was no easy task. But I quickly discovered that I made the most amount of money whenever I leveraged the maximum number of my skills. As a humanities student I was constantly reminded of the “transferable skills” that I was acquiring in my degree, and as a history student, in particular, these skills are what I relied upon every time someone asked me if my job was to memorize people, places, and dates. In my mind, I had paid good money to acquire these skills semester after semester, and it was high time that I started to earn some of that money back! In 2012 I created a small tutoring company with a fellow classmate of mine. On Track Tutoring (OTT) responded to the lack of quality tutoring services available for arts, humanities, and social science students at the university level. At the same time, this business provided me with opportunities to build a website, design promotional materials, manage appointments, and to teach and learn with students from a wide range of disciplines. I am proud to have helped dozens of students reach their educational goals, and to see some become tutors of their own students! In the summer of 2016, with my Ph.D. defence fast approaching, I began to search for part-time work that would help to improve my communication and public speaking skills. To these ends, I started with a local tour company giving guided tours of Ottawa. This job has been a delight, for I have learned about and explored my city like never before and have met hundreds of people from across Canada and the world. I find something very special about the opportunity to show a group of 70 senior citizens from Australia how beautiful our capital is, or to take a group of Canadian high school students to Parliament Hill for the first time in their lives. I’ve learned a lot, seen a lot, made a little money, and my defence felt like a breeze! In the last few months, I have begun to take up contracts with an eye toward the future. I currently work as the communications director for the Canadian Association for Graduate Studies (CAGS), which is the national professional association for graduate education. In this position, I am responsible for web design and development, operating social media platforms, writing the CAGS newsletter, organizing several national awards, and a myriad of other tasks. In addition to this communications work, I am currently engaged in two research projects at the Royal Society of Canada’s national archives, and at Library and Archives Canada. As a history major, I spent countless hours in archives in Europe and North America during my studies. These two archival projects have allowed me to utilize my research skills while also opening up new avenues for future collaboration. As a recent Ph.D. graduate, I often get asked that straightforward yet challenging question: “So, what are you up to now?” I used to disintegrate when this was asked of me, especially at non-academic functions. I knew that the questioners were likely expecting a simple answer, such as “I’m at the government,” or “I’m a historian.” But I have never been able to give a simple answer to this type of question. Indeed, people typically wince when I tell them that I now have half a dozen jobs. They seem to think that I have failed to land the “real job” that I was aiming for throughout all those years of training. Quite the opposite, I beg to differ! I have each and every one of these jobs because I completed a history Ph.D. There is never a dull day in my current work week, and my knowledge, skills, and experience are growing in ways I never could have imagined. I now revel in those “what now?” questions! I have each and every one of these jobs because I completed a history Ph.D. There is never a dull day in my current work week, and my knowledge, skills, and experience are growing in ways I never could have imagined. I now revel in those “what now?” questions! Impressive stuff. I hear you’re a new father — Congratulations! How has it influenced your everyday perspective and routine? I am happiest when spending time with my wife and 10-month-old son, Emmett. I spend a lot of time thinking about the past, so it is incredibly fascinating to look at him and think about the future. Ian with his son. This pump is the same pump from the 1928 Shell newspaper ad. When I am not with my family, I tend to spend my free time in the woods, where I feel relaxed and inspired. Some of my best ideas for my research have been born out of campfire conversations with friends or while swimming in a cold lake! I have recently started a Postdoctoral Fellowship at the University of Calgary, so there are plenty of new opportunities to learn and grow. One thing is for sure, the future will not be boring!